Babblings of a Mommy: Easter Dress Hunting With Target. 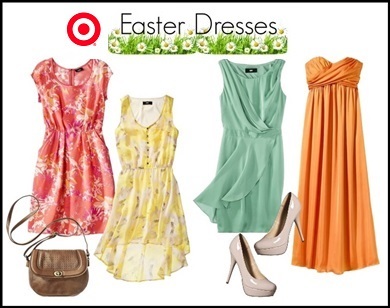 Easter Dress Hunting With Target. Generally one thinks of Easter as more of a kid’s holiday with the Easter egg hunts, and the marshmallow treats, and the trip to see the Easter bunny. But I like to think of it as a cozy weekend to spend celebrating with friends and family. This year, I think we’ve all been thrown for a loop with Easter arriving so soon. In fact, I’ve been caught completely off-guard and I’m not as prepared as I would like to be. Usually by now I have Arianna’s dress picked out and her Easter basket ready to go, but that’s not the case. As for me - well, I’m still on the hunt for the perfect dress - but at least I know where to look! Target has some stylish selections no matter what you’re plans are for the big day. Whether you’re spending the day at home with family, or in the company of friends for a fabulous brunch - they’ve got some styles to fit your needs. I particularly like the Mossimo Fit & Flare dress in bright coral and the Mossimo Hi-Lo woven dress in peach for a more casual setting. Meanwhile, the Mossimo Satin chiffon draped dress in meteor green, and Wrap Front chiffon maxi dress are ideal for a fancier affair. Have you picked out your Easter dress yet? Target has the best stuff! I just went there this weekend and bought some really pretty dresses. Yup. You always find the best stuff!